Real Life Secret Doors [16 Nov 2016] Make a perception check to see your D&D fantasy come true. In the Venn Diagram of my life, the intersection of my job and my love of roleplay games is the tiniest of slender slivers -- so how surprised I was to find that the archive of my work Web site happens to offer a series of articles that gamers will love with a fierce fire of envy and lust! Since we opened the First Edition D&D Box Set lo these many years gone by, we roleplay gamers have been searching for secret doors and hidden passageways. So satisfy a hunger you did not know you had until this very moment by checking out the following photos, videos, and articles about secret doors you can have in your own house -- no ancient mansion or dangerous dungeon required. This Secret Passageway leads down to a hidden basement! But looking at the photo, it looks like this door swings out on a caster -- a wheel caster, not a spell caster -- so over time, if the caster mars the floor, it will give away the secret of the door. Then there's this Custom Home Office Designed to Surprise. I love how high the difficulty check is to detect this one! 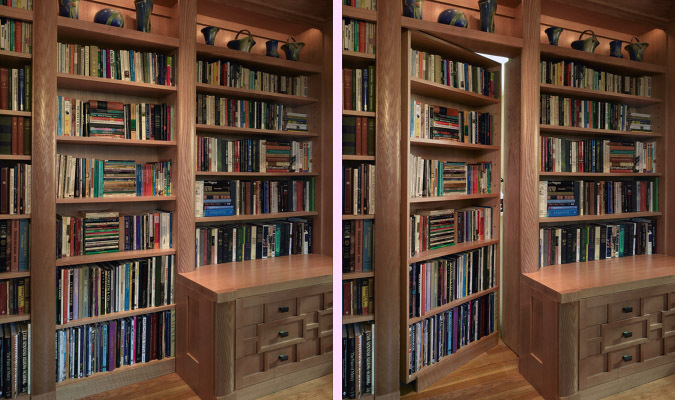 Note that this secret door, also a bookcase, swings in, so there is no way to mar the floor that will reveal the secret. For more photos of the overall project, click here. There are four secrets to be found in this Hidden Door House -- but the secrets are pretty easy to find, if you know to look for cracks and the like. Click here for more photos and the video walkthrough. 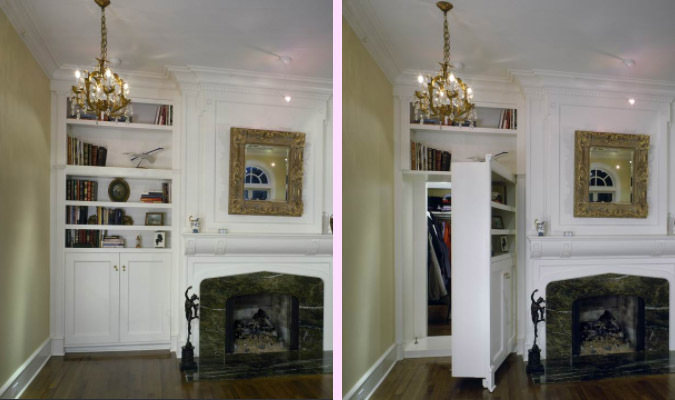 This Artfully Concealed Closet, on the other hand, is truly artfully concealed! The contractor says, "I can show this one to you because behind it is only a coat closet. Most of them, if I shared it with you on the Web ... they'd have to kill you."